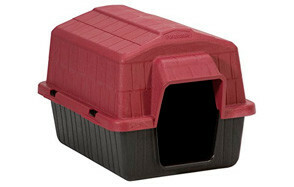 Dog houses offer excellent protection for your pet especially in the cold months of winter. This is especially beneficial for dogs that are unable to regulate their body temperatures efficiently such as elderly and sick dogs as well as puppies and naturally skinny hounds. Choosing the right dog house for the winter is, thus crucial to helping our pets feel comfy and warm as they weather through the bitter cold. While there are plenty of dog houses in the market, only a handful deserve to be called as the best for your canine friend. Here we’ve listed 8 of the best dog houses for winter according to pet parents, dog-lovers, and animal experts. 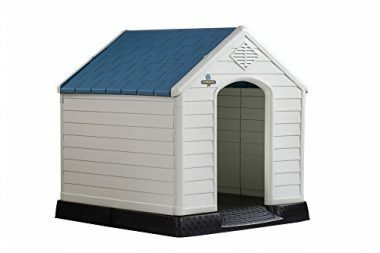 The Suncast DH350 Dog House offers ease of assembly in a snap-on design, giving your canine friend not only ample protection against the bitter cold of winter, but also an abode that it can truly call its own. The DH350 comes with a vinyl door that can be personalized with your dog’s name using the letter set that comes with the package. Beautifully detailed like a miniature home, Suncast more than protects your pet during the cold days. It also helps provide comfort for your pet during the warm summer months through air vents built into its design. Cleaning is super-easy since dust and dirt won’t be clinging to the slick surface of the resin material. The removable roof also allows for easier cleaning of the interior. One of the most interesting features of the Trixie Dog Club House is its set of fully adjustable feet made of highly durable hard plastic. The height of each individual leg can be adjusted to allow for an even resting surface on uneven terrain. The off-center door design allows for maximum protection as your pet can snuggle in the covered section of the Club House. Made of solid pine wood and treated with a waterproof finishing, the Dog Club House provides superior protection from cold drafts, thanks to the integration of tongue-and-groove elements on its exterior panels. The roof is slanted at the back to channel water away from the front where the door is located. The flooring is also elevated for additional protection against the bitter cold as well as added ventilation during warmer days. 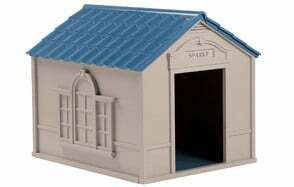 The uncanny resemblance of Pet Zone’s Our Pet’s Tuff-N-Rugged Dog House to the playhouses of Little Tikes provides a variety of clues as to the overall quality of the Tuff-N-Rugged. 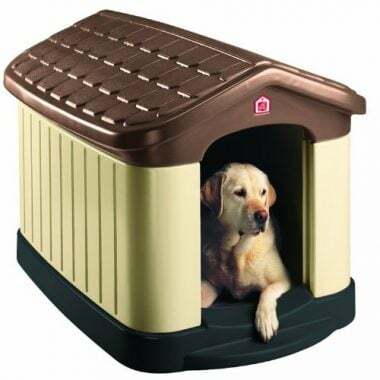 Made of durable material that has been treated with UV protective coating, the Tuff-N-Rugged comes with a double-wall construction which effectively increases the distance between the dog house’s interior space and the outside environment. 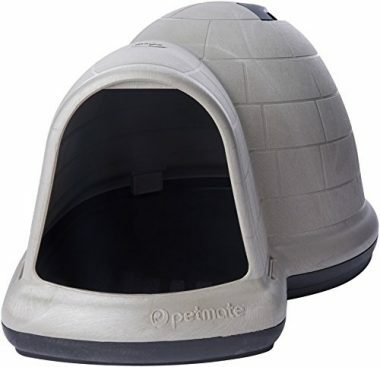 This helps provide for a warmer and definitely more comfortable abode for your pet. The same double-wall construction can also be beneficial in the summer since it can help reduce the amount of heat entering. The only issue that you may find is its price tag. But given that the Tuff-N-Rugged is one sturdy dog house just like your Little Tikes playhouse, it should be worth the investment. Petmate decided to draw inspiration from the ubiquitous igloo of Arctic peoples in coming up with the Indigo. The Indigo comes with a doorway that is offset and extended for better protection against cold drafts and the rain. There are air vents at the top of the dome for optimum ventilation in warmer-than-usual days. The wall is constructed of heavy-duty materials, lined with insulating foam, and finished with the Microban technology that helps ensure no odor- and stain- causing microorganisms will be able to wreak havoc. The raised floor is surrounded by moat to help channel liquids away from your pet. The dome shape of the Indigo also helps slough off rain and snow, allowing for better protection for you dog in the winter. Because of the thoughtful design of the Indigo, its rather prohibitive price tag is well worth it. 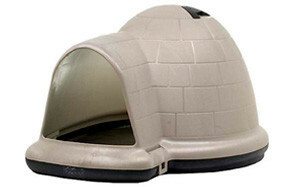 One of the most striking features of the Confidence Pet Waterproof Dog Kennel Outdoor Winter House is that it has a taller and slightly narrower door compared to other designs. It is made of durable plastic materials making it exceptionally easy to clean. The flooring is elevated from the ground surface, too. Unfortunately, there were some issues about the Confidence that is worth noting. While it is labeled as Outdoor Winter House, it clearly doesn’t include any form of insulation. It might not be wise to put it outside when it’s snowing and all as the plastic surfaces won’t really keep the cold out. It is also easy to assemble, but you will need a few basic hand tools to set it up. It is for these reasons that some folks believe the Confidence is simply overpriced especially when compared to other dog houses that have the same design and with a few additional features yet are priced much lower than the Confidence. 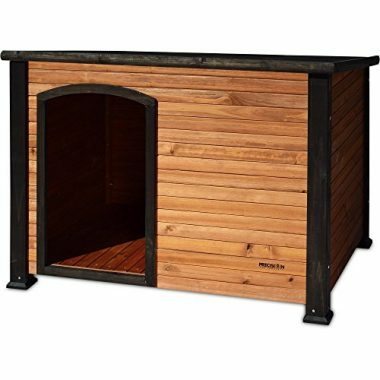 Made of natural cedar wood and finished with weather-resistant coating, the Precision Pet Outback Log Exterior Dog House is perfect for pet families who love wooden furniture. Like other dog houses that have an off-center door design, the Outback provides better protection for your pooch against cold drafts. The flooring is also elevated so there’s no chance water will be getting in from the ground. Unfortunately, it doesn’t have rain protection on the doorway. The roof cannot be opened either, a feature that is typical of such designs. 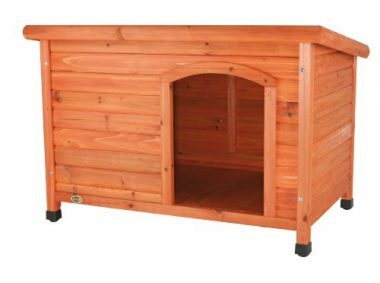 Perhaps such omission is understandable considering that it is priced lower than most dog houses that have the same design. The feet are made of plastic, though. At least Precision Pet gives you a 12-month period to give it a try. It may be priced higher than similarly-designed dog houses, but there is one particular feature that is found in the Petsfit Outdoor Dog House that other brands failed to integrate into theirs. The Petsfit comes with door flaps that will help provide easy access to its spacious interior while keeping drafts and cold outside. 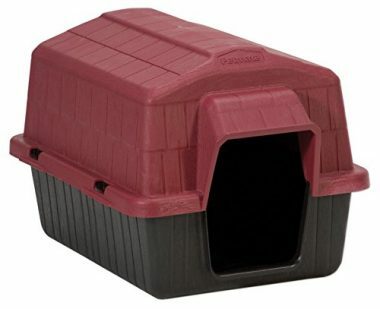 Most dog houses come with an open doorway so cold air can still get inside. It may not have thermal layers but the addition of door flaps can truly count as an innovation in dog house for winter design. The roof can also be easily opened for cleaning purposes and for accessing the removable floor panel. It is without a doubt that the Petsfit Outdoor Dog House can be rightfully called as one of the best dog houses for winter. Petmate’s Barnhome III Dog House looks more like a travel dog crate except that it doesn’t come with a handle or caged windows and doors. The thing about the Barnhome is that it comes with a rear ventilation system which should help keep your pet comfy on unusually-warm days. The door comes with eaves which helps provide ample protection from the rain. Channels on the eaves also direct water away from the entrance and to the sides so you can keep your canine friend toasty warm and dry inside. For added insulation, you might want to purchase the door flap. Sadly Petmate did not include this as a standard. Dog houses for winter come in various designs, sizes, and shapes. Some are packed with features while others are only embedded with the essentials. You need to understand that picking the best dog house for winter can be tricky. Our guide for choosing and buying the best dog house should help you navigate this maze. Knowing the difference between an ordinary dog house and a doggie abode built for the winter can help you decide on the best dog house for your pet for use during the winter months. The main difference in these two types of dog houses is in the presence of thermal insulation in dog houses for winter. Thermal insulation can come in different forms, although what many would consider as insulation is the presence of an extra layer of protection which can significantly increase the barrier between the interior of the dog house and the ambient temperature outside. Some dog houses for winter come with thick thermal insulation made of polyurethane foam since it has an excellent thermal insulation R-value of 6.3 for every inch of thickness. Other manufacturers use polystyrene and cellulose, although others would go for fiberglass or mineral wool. Other dog houses for winter also come with additional features such as extended doorways and door flaps to help keep cold air drafts from getting inside the doggie house. Some also come with double-wall construction, effective increasing the distance between the outer wall surface and the inner wall surface. Regular dog houses will be those that do not have any of the mechanisms we have described above and as such are excellent for warmer weather conditions. What Makes a Good Dog House for Winter? Picking the right dog house for winter can be particularly intimidating especially if you recognize the fact that there are plenty of products in the marketplace all saying they are the best in keeping your dog warm and cozy when it’s freezing outside. Zeroing-in on the best dog house for winter requires an understanding of the characteristics of a good dog house for winter. Here are some of them. A good dog house for winter should have adequate thermal insulation. This is the first and perhaps most important characteristic of a doggie house intended to be use during the winter. As we have already explained above, dog houses with PE foams should offer exceptional warmth even when it’s freezing outside. This is akin to having good insulation. The thicker the wall the better it is when it comes to keeping the interior warm and cozy. Raising the floor provides two fundamental benefits. It makes the sleeping surface warmer in cold months and cooler in warm months for the simple fact that it is moved farther away from the ground surface where the earth’s temperature can be easily felt if the floor is not elevated. Waterproofing is now a standard for all dog houses. But this is especially true for dog houses for winter particularly those that are placed outside the house. Snow can accumulate on the roof and has the tendency to melt once the sun’s up. Rain can sometimes accompany snow so keeping your dog warm and dry inside its house can be ensured with a waterproofed dog house. In addition to these characteristics you also need to look for durability, ease of cleaning, and ease of setting up. These are characteristics that you would normally look for in any type of dog house. A well-insulated dog house for winter does a good job at protecting your dog from the bitter cold. Regrettably, there are days when the temperatures outside can be extremely cold that even a well-insulated dog house is unable to keep your dog warm and comfy. Here are some tips on how you can keep your dog house warm and comfy. Consider investing in a pet-safe dog house heater. These are small devices that you mount onto the wall of your dog house and work in pretty much the same way as the heater in your house, only this one is made specifically for dog houses. Do take note, however, that these may cost more than the price of your dog house. Purchase a heating kennel pad to be placed under your pet’s bedding inside the dog house. This helps provide warmth to your pet’s body and also increases the distance between the floor and your dog’s body. Under no circumstance should you place this directly on your pet’s bed as it can also overheat your pet. Use heated dog beds in lieu of the heating kennel pad. This is a special type of bed that comes with a heating element inside. Unfortunately, these can only be used indoors. You can also make a heater box which is similar to the droplight used in hospitals to help warm and heal the perineum of women who just gave birth. It’s nothing more than a box open on one end and having a light bulb shining inwards on the other end. The problem with this, of course, is the risk of breaking the light bulb. 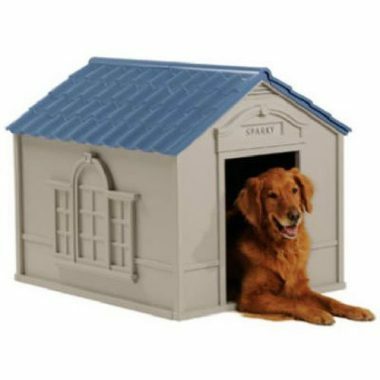 Make sure you have the right size of dog house for your pet. Too big and you risk losing more of your pet’s heat to the interior space. Too small and your dog will not be able to move about comfortably. Increase the elevation of your dog house without limiting its accessibility. Also place it away from running water or areas where puddles usually form. Do not place the dog house in an area where wind usually blows. Cold drafts can be menacing to dogs even though they are already inside their dog houses. If your dog house already comes with good insulation, make sure that there are no breaks in the integrity of the insulation. You may also want to check the flooring, walls, and the roof for any signs of damage or leaks. These can be entrance points for cold air. Fix these if you can. Owing to differences in breed characteristics, there are certain dogs that need more protection from the cold compared to other breeds. Generally, dog vulnerability to cold temperatures is often dictated by the following factors. Dogs that have thinner and single-layered coats suffer the most in cold temperatures. As such if you have a Greyhound or even a Xoloitzcuintli, also known as the Mexican Hairless, then you know that these dogs will need exceptional protection against cold. Interestingly, experts say that dogs with light-colored coats tend to feel the cold a lot more than their dark-colored counterparts. This observation works only during daytime when the sun is up as heat can be easily reflected off white- or light- colored objects. In general, smaller dogs have a higher ratio of body surface area to volume. Technically they have ‘more’ skin surface area upon which they can readily give off heat. As such smaller breeds are more vulnerable to the effects of cold temperatures given, however, that all other factors are equal. Everyone knows that one of the essential functions of body fat is insulation. In other words, thinner dogs or those canines that do not have sufficient layers of fat tend to feel colder than their fatty cousins. However, do understand that being fat does have its many drawbacks especially on the heart and metabolism. If this is the only reason you have for making your dog fat, know that there are other ways in which you can protect your pet from the bitter cold. Extremes in age are a major factor in susceptibility to the effects of cold weather. Puppies don’t have mature thermoregulatory mechanisms so they feel colder than adult dogs. They also have a larger body surface area in relation to their body mass. On the other hand, senior dogs already have poor muscle tone, reduced amount of fat, and a less-than-optimal thermoregulation, making them vulnerable to cold effects, too. Dogs that are sick generally cannot regulate their body temperatures as efficiently as when they are healthy. As such, sick dogs will also require protection from the cold. Dogs that are already accustomed to living in cold weather have developed adaptive mechanisms to make them highly resilient even in extremely cold conditions. As such, if your dog is already accustomed to cold weather, it may require less protection against cold. Any of these factors can play a part in a dog’s vulnerability to the effects of winter. Here are some of the breeds of dogs that really require our assistance when it comes to protecting them against the bitter cold of winter. Dog houses for winter help keep our dogs warm and comfy in pretty much the same way that our homes keep us safe and well-protected from the elements. Insulation is a fundamental requirement for all dog houses for winter. As such, your efforts at looking for a suitable house for your pet dog to be used during winter should be focused on the quality of insulation as well as other features that can keep cold air out. Of course, if that fails or if you need additional warmth for your pet, you can always consider our tips on how to keep your dog house warm.